I couldn't believe it but after 12 weeks of training, race day was finally here. I don't know if it was bitter sweet or if I just wanted it to be over. Training was really hard, but rewarding. There never seemed to be enough hours in the week to get all of my runs in and I lost sleep over it many a night. But it was a great feeling to be done with a long run. Race day turned out to be BRUTALLY hot and completely not what we had trained for. It was very disappointing to do so much work and then wake up and feel unprepared. BUT in reality we were prepared and we finished. Not in any record time, but we did it. KARA, WE RAN A HALF MARATHON. I am still a bit shocked. I don't think I will do it again because of the time commitment and the fact that I am about to lose my big toe nail (yeah too many bad side effects of running in that heat! ), but I am very proud I did it this once. Not only are we so excited to get outside again, I can fully appreciate my Fridays off even more! 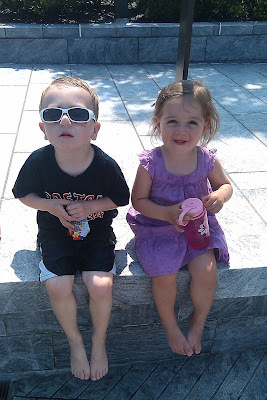 Nothing like getting to spend the entire day outside with the kids. And there is nothing better than our fountains. This day we met up with a bunch of our neighborhood friends as well. Oh boy did spring and the weather play some serious tricks on us this year. It has been so cold and very rainy for the whole season. And then one day, it was all gone and spring was here. We are so glad to get back to our outside routine. The kids usually play in the fountains after school and then we head out after dinner for some more......well usually sports! 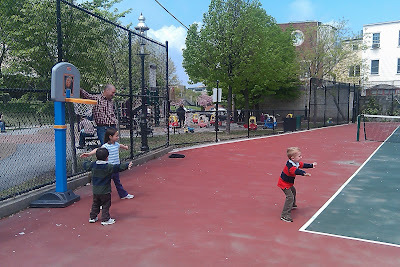 There are so many parks here that the hardest part is picking which spot we want to play at. Angela's new favorite thing is the carousel. She is obsessed with it and loves riding, but still too afraid to go on her own horse by herself. We talk about it A LOT and then finally she did it! "Angie ride horsie big girl" she says. I love living in the city! Grandpa and Nana Sheila came into town for just long enough to have dinner and dessert. They took us for a delicious family style Italian meal. As you can see, Richie tried to help pay. The only way to go couch, cabinet AND fridge shopping in the same day with 2 kids!! 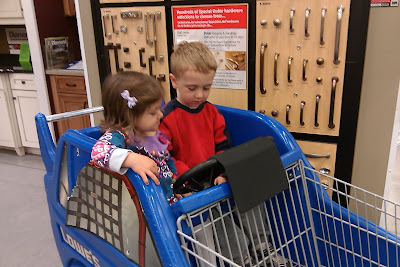 Thank god for the invention of the iPad and race car shopping carts! Not great pictures, but HAD to post them! This was the group that went to Cape Cod 2 summers ago for a week. We had so much fun then and continue to have fun the few times we get to see Katie and her adorable family when they are able to come back into town. 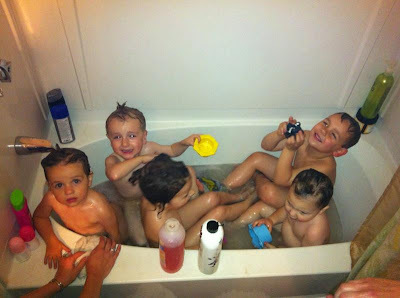 Did you think you could fit 5 DIRTY kids in the same tub? The water was black when they got out. Not really sure how clean they got, but the surface dirt came off at least. Richie, Colton, Kay, Angela and Theo! 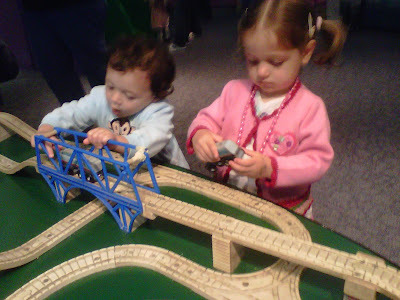 Angela with Dawn and her neighborhood friends at the Children's Museum. Richie finally had his first baseball clinic. It has been a long time coming because he has been excited about it for WEEKS. It is a clinic to teach four year olds how to play the game. 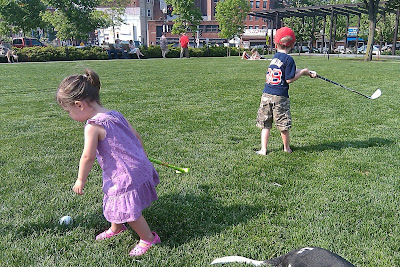 It is basically before they are old enough to play t ball. The clinic was 2 hours long and Richie stared at Coach Dom the whole time waiting on every word that came out of his mouth. And Coach Dom is a funny character because he is no spring chicken and he can't hear a thing. The kids would tell him their names and he couldn't hear any of them. 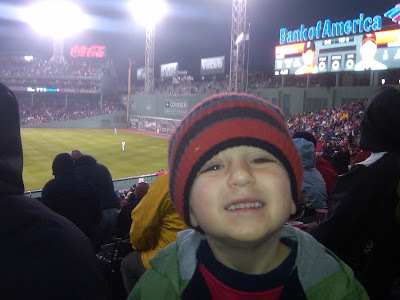 You can see him get his uniform, do some stretching, learn about the game and run the bases. I didn't know whether to laugh at the situation that was occurring or cry because my baby was in a baseball uniform. Look at the size of the smile on his face! Richie had a May Fair at school so we stopped by on our Friday day off together. I didn't know exactly what to expect because I didn't know what it was. Well it turns out it is this crazy fair with lots of food and games. The kids had a blast, but it was much more than I could handle. We stayed long enough to get lots of treats and little prizes. Rich was the most excited about the sports game and did really well. I can tell he has been practicing ALL of his sports! 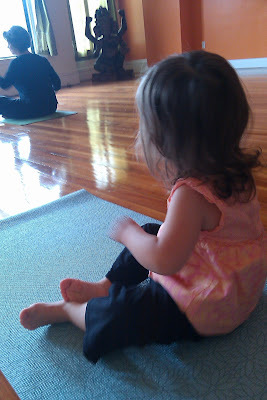 Angela and I are in our second session of yoga and she still loves it. I took pictures today (with my phone, the reason for the poor quality) because Richie has been asking each week for them. He seems very interested (or jealous) in this time of ours together. Angela is really the only kid in the class who can pay attention the entire time. For Mother's Day this year we stayed in Boston and had a wonderful day. I did exactly what I wanted to do.....NOTHING! Well of course that is never fully true with us. I got to sleep in and woke up to pancakes for breakfast. Then we headed to church and the playground afterward. It was the kids favorite part of the day. Angela can go down the slide one hundred times an hour if allowed. 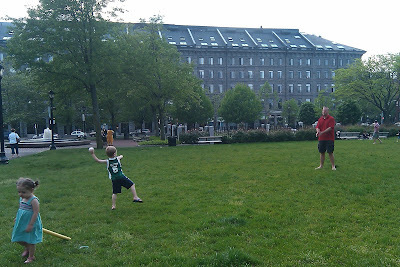 And Richie found a pick up game of basketball which was one of the cutest (but very grown up) things I have ever seen. I should have taken a video because you can't tell in these pictures how these kids thought they were real basketball players! Since we now have 6 tickets to all of our Red Sox games we have started asking lots of friends to join us. Today we asked Richie's school friend Caitlin. It is an understatement to say that he LOVES her. 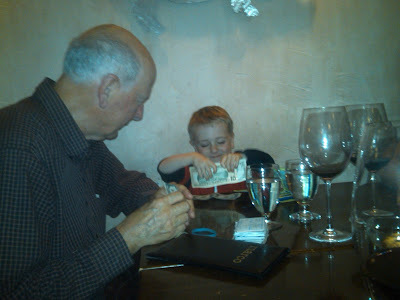 She is a year older and from the first St. John's event we attended this past summer she has been the apple of his eye. He was so excited her and her parents were coming with us....well until we got there that is. He froze up and couldn't even bring himself to sit next to her. It took at least 2 full innings before he would look her way. BUT, once he warmed up they were inseparable. They sat on the backs of their seats and sang, cheered and just smiled at each other a lot. It was beyond adorable!